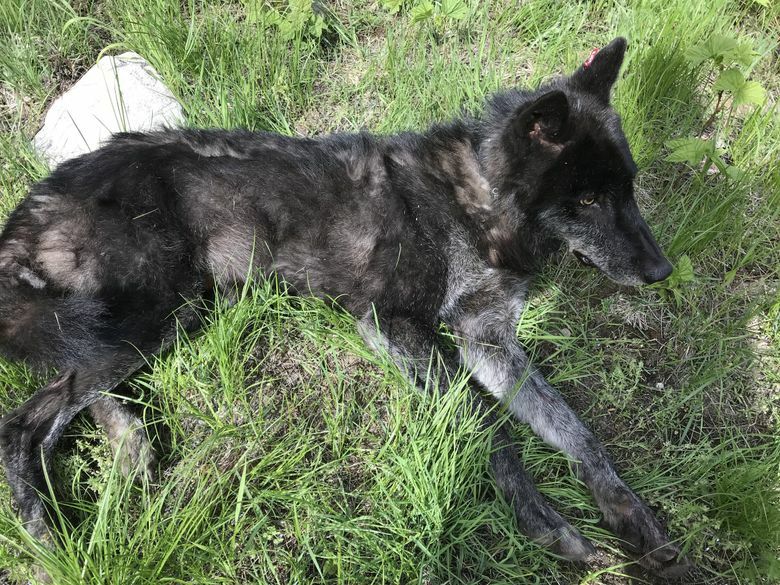 The soulful howling of another endangered wolf was silenced early this month by the state Department of Fish and Wildlife. Just discovered in February, the Togo Pack pair had its first pups this spring — only to lose their dad to a deadly department marksman last week. With one of their providers gone, these pups may now starve. Sadly, the Togo alpha male had already been wounded by a rancher who went to the wolves’ rendezvous site, the place where parents and pups meet, and shot the wolf in the leg. The killing of one member of Washington’s small wolf population is tragic. It will do little or nothing to reduce the risk of future livestock losses. It also won’t improve social tolerance for wolves among ranchers. Yet these are the department’s primary justifications for killing the wolf. Studies show killing wolves to prevent conflicts is often counterproductive. It can increase the risk of predation on livestock by breaking up packs, forcing individual wolves to prey on whatever they can. In contrast, numerous studies demonstrate that a variety of nonlethal measures — such as guard dogs, range riders, fencing and moving cows — reduce livestock loss. Using these nonlethal measures is the best way to protect wolves and livestock. But these steps are only partly taken in Washington. State wildlife officials have crafted a wolf-livestock conflict protocol that includes fairly minimal requirements for nonlethal measures. It requires the use of any two methods without requiring demonstrated effectiveness or appropriateness to local conditions. The protocol simultaneously calls for the department to move quickly to kill wolves in response to relatively small numbers of lost livestock. This means that every time cattle are lost, rabble rousing begins urging the killing of wolves. This is the opposite of social tolerance. As in other states where citizens help recover wolves, Washington has a compensation program that pays ranchers for livestock lost to wolves. Ranchers are entitled to full market value if the conflicts were on small private lands, and double the market value for losses on grazing areas of 100 acres or more, such as public lands allotments. In exchange, there must be some tolerance for loss before we start killing wolves, particularly since this loss is typically small, amounting to a fraction of the losses to livestock from domestic dogs, bad weather, illness, birthing complications, trucking accidents and other factors. But the department’s killing of the Togo male wolf is hardly the first time the agency has opted to slaughter Washington’s endangered wolves to benefit the livestock industry. In Washington, there are 1.1 million cattle and around 120 wolves. Yet, from 2012 through 2017, by our count, state wildlife officials killed 18 endangered wolves — 15 on behalf of one livestock operator alone. In the process, the department destroyed three entire packs. Based on polling, it’s clear a majority of Washingtonians want wolves back in the state and don’t want them killed when there are better tools for dealing with livestock losses, including both compensation and programs to help ranchers develop effective nonlethal measures. They want exactly the opposite of what happened to the Togo Pack’s alpha male. To fix this problem, wildlife officials need to follow the science by ramping up nonlethal measures, opening their decisions to scientific peer review and public comment and do more to protect our endangered wolves, which after all is the agency’s mission. In the meantime, let’s hope the Togo Pack’s mom manages to feed those pups and that wolves continue to recover and thrive in their historic home in Washington. Amaroq Weiss is a biologist and former lawyer with the Center for Biological Diversity, which is a national nonprofit conservation organization with more than 30,000 members in Washington, as well as five staff based there. Weiss, who lives in Petaluma, Calif., has worked in wolf recovery and conservation policy for 21 years and covers wolf issues in Washington, Oregon and California, as well as having worked in Alaska, the northern Rockies and the Southwest.